I also had a pair of grapevine wreaths hung inside the chunky frame before, but swapped them out with an antique German roe deer antler mount that I bought in High Point and attached them to a large slice of basswood. I also tucked in bright green reindeer moss, candles, birch orbs, and a few acorn ornaments (from Hobby Lobby). The antler is a shed found in the woods in N. Idaho before we moved to NC. Yes, deer, elk, moose, etc shed and regrow their antlers naturally almost every year. The dining room is definitely feeling "woodsy" now and in many ways reminds me of home back in the Northwest where lodge-decor is a mainstay... All we need is Christmas dinner! Kristen, your dining room looks gorgeous! I love that towel that inspired it and it looks amazing as a pillow! The room looks like the perfect holiday woodland place for a wonderful holiday dinner. Pinning and sharing! Hope you have a merry and happy day! Hi Kristen, Thanks for sharing your lovely dining room with us! I especially love the tree prints that you framed. Beautiful table settings. Happy Holidays! Kristen, Kristen, Kristen, OMG I love it all. 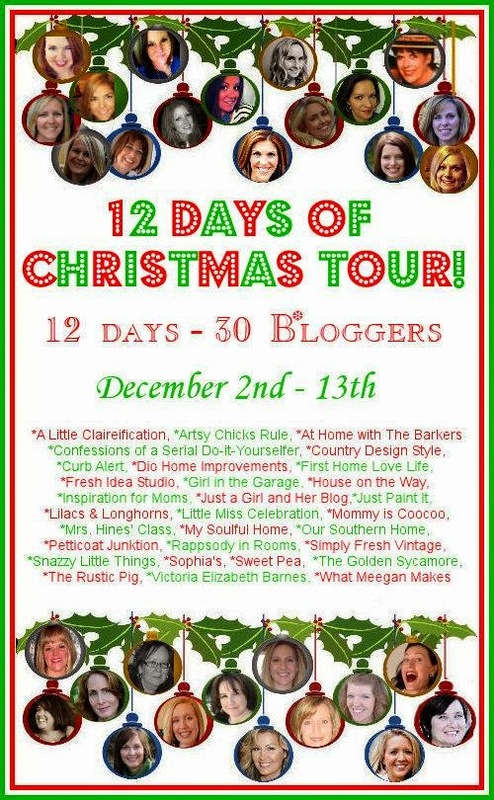 Those prints on the wall and the framed antler are my favorite!! so pretty! love all the fresh greens and love the pillow! Just beautiful, Kristen! I love the towel turned pillow. It reminds me of the Cavallini calendar images. this is so gorgeous, Kristen! I said it before, but that green wall color and accessories has become one of my favorites, and love your woodland theme! I love the towel that you found at the CL fair. Making a pillow from it is a much better way to enjoy it. Your table decor is so pretty. I had to look at each photo for a long while to take in all of the details. Thanks so much for sharing you home with us this Christmas. Looks like you had a lot of fun putting your dining room together...Magnificent Job!Thanks for sharing. Your home looks like it cam out of a magazine! You are o talented. I am inspired and loving this look. Shared on my FB page right now. Kristen, I'm smitten with your holiday table! Actually you're whole dining room! The green is gorgeous and all the natural woodland inspired accents are beautiful. Kristin, I absolutely love your lime green decor. The dining room wall with the botanical prints is perfection. Also loving the silver accents. Thanks for sharing! Have a great week. Kristen your dining room is gorgeous! I love that pillow you made! The silver deer on the table are adorable, Love that you used those trophies how fantastic is that and I adore the antler I want some of those so bad I should go hiking around our woods!! You have done a beautiful job in your dining room it's fantastic!! Your table should be in a magazine- so gorgeous! I am love with how you used your antique trophies, just brilliant. Everything looks perfect together. Thanks for sharing with us! AHHH! So crisp!!! Love the bright green and woodland theme! That pillow is to die for! Love your table, the antlers...Seriously awesome! Very talented lady… that's you! Thanks for the link to Vintage Printable. How did you get the resolution to work for such large prints (from Costco, right?). I tried to have them printed but it warned of resolution quality being poor. I must be doing something wrong. Any suggestions? SO beautiful!!! I love everything! The table runner is gorgeous, and I love those roses! Thanks so much for sharing! Totally gorgeous table and I love the artwork! I LOVE it! I love the color palette and all of the natural elements. I love the seasonal art. I love the mix of patterns and texture. I just love it all!! I just don't know how to describe how much I love this post! Everything is so pretty! You did a fantastic job with your dining room and the green colors with the natural elements looks so lovely! Absolutely Beautiful! The antique trophies are a brilliant idea. Your whole table just looks so inviting and divine. Thanks for sharing! 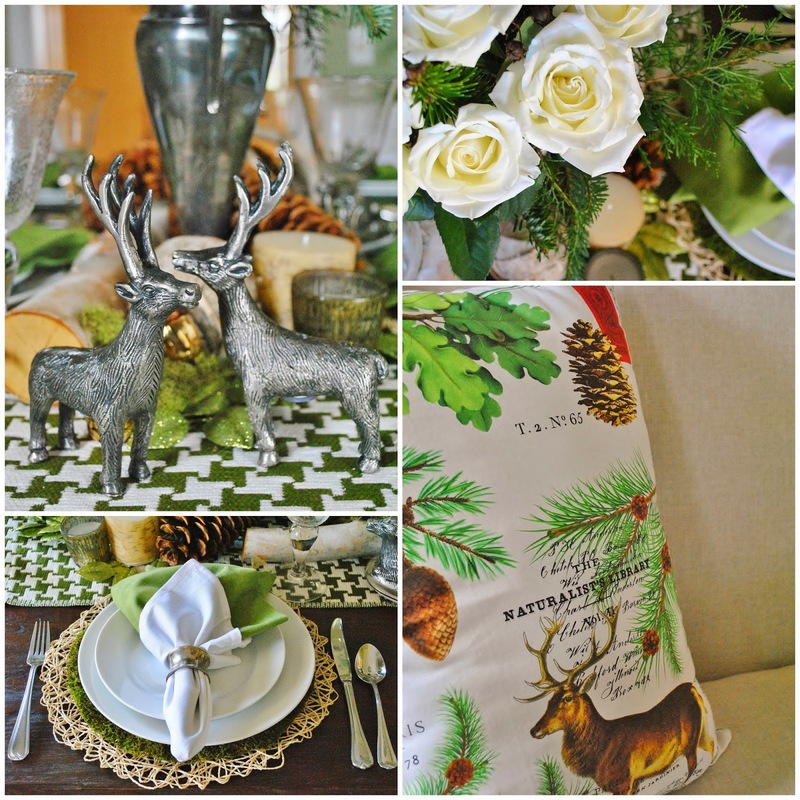 Your woodland theme is so perfect and the touches of green and white are beautiful! I love the detail you place everywhere. It's been a pleasure to be a part of this tour with you. Happy Holidays! Wow -- simply beautiful! I just love the green and white houndstooth mixed with the pewter and silver -- stunning! Pinning! So happy to be touring with you. Merry Christmas! This is so beautiful! 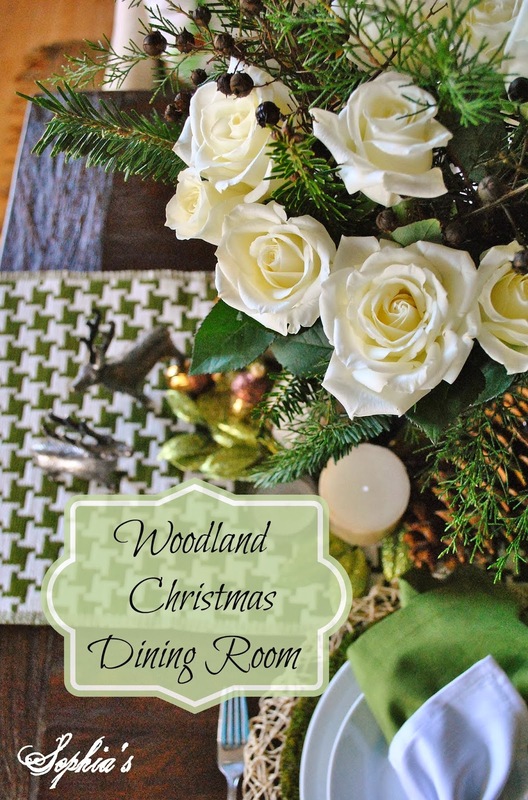 I'm going for a woodland theme in my dining room this year too, but I'm not as far along as you! I just love how you mixed those gorgeous roses in with the rustic elements. Such great inspiration! I'm loving all that green! It's so fresh and young looking. All your details are wonderful, the moss, the prints and those vintage trophies (very hard to find here) with greenery are perfect! thank you so much for your kind comments about my post. I'm so glad I found you. This is just beautiful -- I'm in love with that runner!! Swoon Kristen! I love your woodland theme and the green that all started with a towel turned pillow! Your green houndstooth check runner is wonderful! I'm Guest Hosting at The Scoop Link Party!